I am so excited to share with you this special nomination I received and pass it on, as well, to some fellow food bloggers from Fiesta Friday. 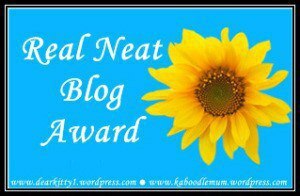 I received the Real Neat Blog Award from Arasi at Arasis Kitchen. Having been nominated for this award is such a lovely surprise. I was so happy to receive this nomination from Arasi. She has such a wonderful blog, filled with authentic south Indian recipes from her mom and mom in law. If you can, please do stop by and visit her blog: Arasis Kitchen. Thank you so much Arasi! Now it is my turn to nominate some lovely food bloggers to this award . Here is the list of my nominees. Answer 5 questions asked by the person who nominated you. 1. When did the idea of writing a blog strike you ? About a year and a half ago. I stumbled upon a blog when Googling research and found it inspiring. It looked like a fun, creative way to share my experiments in life. 2. Is there any obstacles you face while writing for your blog and how do you overcome it? I feel one of the biggest obstacles is in not having enough time for my blog. I don’t feel there is enough time to truly do what I want with my blog, to take it to that next level. I try to spend at least two nights a week, a couple of hours on my blog. 3. What is your favorite post in your blog? I love to write and enjoy participating in the writing challenges here on WordPress. I am not that great but, I really enjoyed writing a pierce about a year ago called Back To The Sea. Of course, I have to add a food post, Apple Cake with Caramel Drizzle, it is easy and delicious!! 5. Is there anything that you wish to do but you could not do? I wish that I had a good singing voice, I think that would be so cool. 6. Is there any creative characters (in any movies) you think is similar to your character? Not sure …I will have to think more about that one. 7. If there is one suggestion that you could give to amateur bloggers, what it would be? 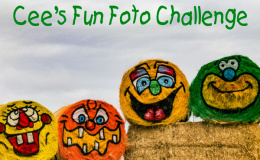 Try to post at least once a week and get out there and visit other blogs and make friends, join link up parties and weekly challenges. 1. What motivates you to blog ? 2. What is your favorite blog post? 3. A place/region you would like to visit very much. 4. Craziest thing you have ever done ? 5. Blogging is hobby or passion ? 6. Favorite color and how do you associate with it ? 7. What is that one thing you love most about yourself ? Place hash browns in a strainer and rinse with cold water until thawed. Drain thoroughly; transfer to a large bowl. Add onion, parsley, milk, eggs, flour and salt; mix well. In a skillet over medium heat, heat 1/4 inches of oil. Drop batter by 1/4 cupfuls into hot oil. Fry until golden brown on both sides. Drain on paper towels. Note: If using refrigerated hash browns, skip the first step. 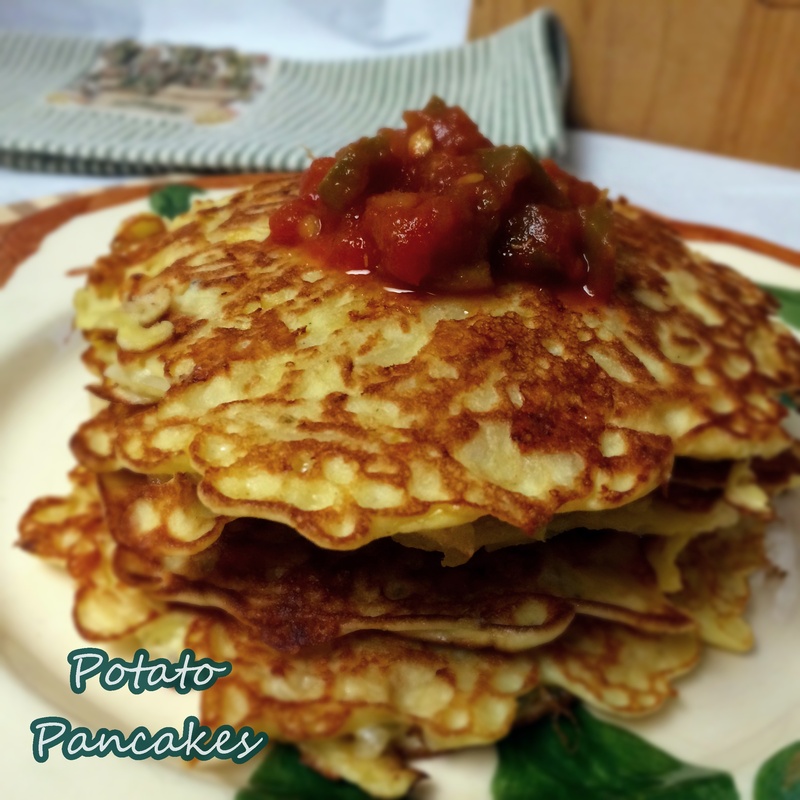 These potato pancakes go great with scrambled eggs for a delicious breakfast! Congratulations on your award! And these potato pancakes sound great! Congrats to you!! You rock for nominating me too 🙂 Thanks!! My husband is obsessed with potato pancakes. I like your frozen hash brown shortcut- it seems it would eliminate excess moisture issues. Great! Thank you Josette! And you are welcome 🙂 wishing you a great weekend! Congrats on your award and my whole family enjoys potato pancakes. Frozen ones are a lot easier to work with and definitely saves time. Thanks for sharing with Fiesta Friday! Aww …thank you Angie!! What a lovely thing to say, ditto here! 🙂 Potato pancakes coming right up 🙂 I haven’t posted anything for Fiesta Friday today …the week has kind of gotten away from me, ha! Maybe I will have a chance this evening. Happy FF to you! !